Heat oven to 375°F. Combine all topping ingredients except pecans in small bowl; stir until well mixed. Stir in pecans. Spoon topping evenly into 6 ungreased jumbo-sized muffin pan cups; set aside. Divide dough along perforations into 6 sections (2 strips each). Gently press each section of dough together to form 5 1/2x2-inch rectangle. Spread each rectangle with 1 1/2 teaspoons Cinnamon Sugar Butter Spread. Roll dough up loosely, starting at 2-inch side. Pinch seam to seal. Place rolls into prepared muffin cups, spiral-side up; press down firmly. Bake for 15 to 19 minutes or until golden brown. Immediately invert onto serving platter. Let stand 1 minute; remove from pan. Serve warm. Substitute ungreased 9-inch round cake pan for jumbo-sized muffin pan. Prepare rolls as directed above. Bake at 375°F. for 22 to 25 minutes or until golden brown. 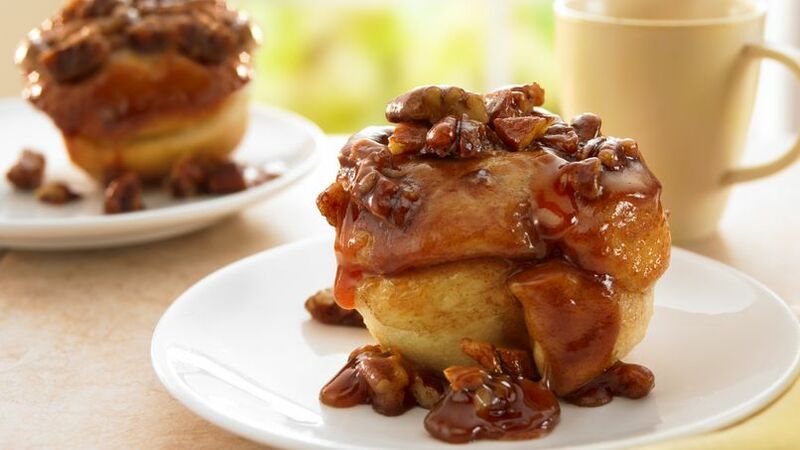 These ooey-gooey caramel rolls are best eaten warm.